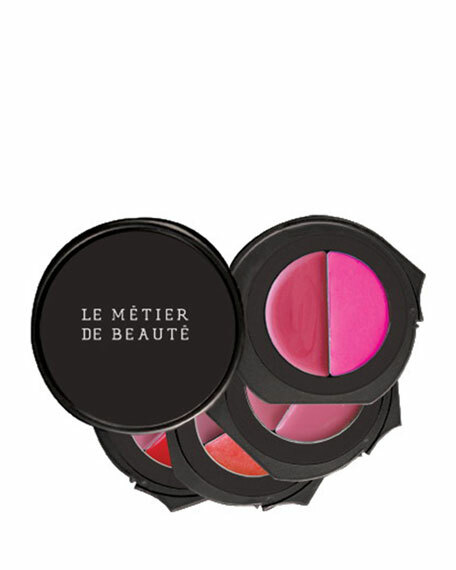 Le Métier de Beauté's kaleidoscopes achieve their beauty not through its singular colors, but through the interactions between all the colors, it's how the shades interact and play upon each other that yield an incomparable result. Each shade is handpicked by our Director of Color to communicate an inspired vision that allows for infinite looks through blending and layering of the palette. Add luster to your life this season with the new jewel-toned lipstick & lip gloss silhouettes from Le Métier de Beauté. A chrysalis break from the dull-drums of dreary neutrals, there is nothing more universally flattering than gem color. Jewel tones make everyone look instantly more radiant! Introducing The Obsidian Odyssey Lip Color Kaleidoscope Collection ... Take the voyage! Rose Quartz & Jasper Gloss. For in-store inquiries, use sku #242558.